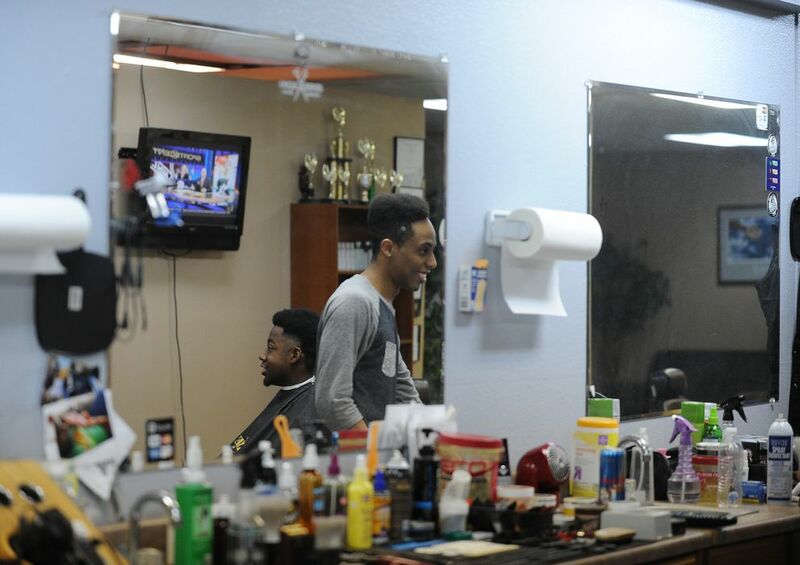 On most days, you'll find 21-year-old Marcus Freeman cutting his clients' hair at Unique Blends, a spacious barbershop on Muldoon Road. On a recent Tuesday afternoon Freeman meticulously shaped up a client's hair with an electric shaver. ESPN played on wall-mounted TVs as the men quietly chatted. A steady rain fell outside. 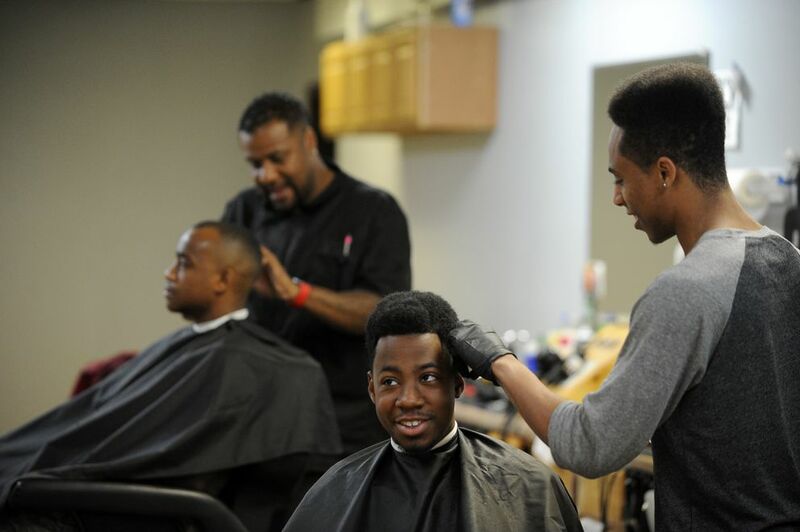 "I don't really think of it as a job," said Freeman of being a barber. He's worked at Unique Blends for about two years, and "it's never a hassle. It's never something that I'm tired of." 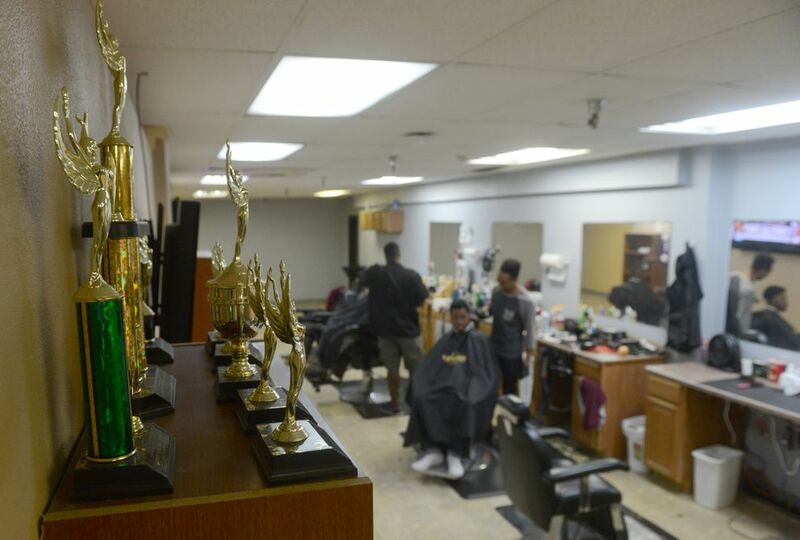 On a bookcase near a TV, shiny trophies from barber competitions sat on the top shelf. The bulk of the awards belong to Freeman. In the evenings, however, Freeman's focus shifts from trimming hair to hip-hop dance. What started out as a hobby in high school has become so strong a passion that he decided to save up his money from cutting hair, his primary source of income, and open his own hip-hop studio in East Anchorage's Northway Mall. He's also been teaching hip-hop classes at local studios and building name recognition. "Other companies are doing a great job in what they do," Freeman said. "I just feel that we're taking a little bit of a different approach, and it's going to be very fun to see how we work and where we go." 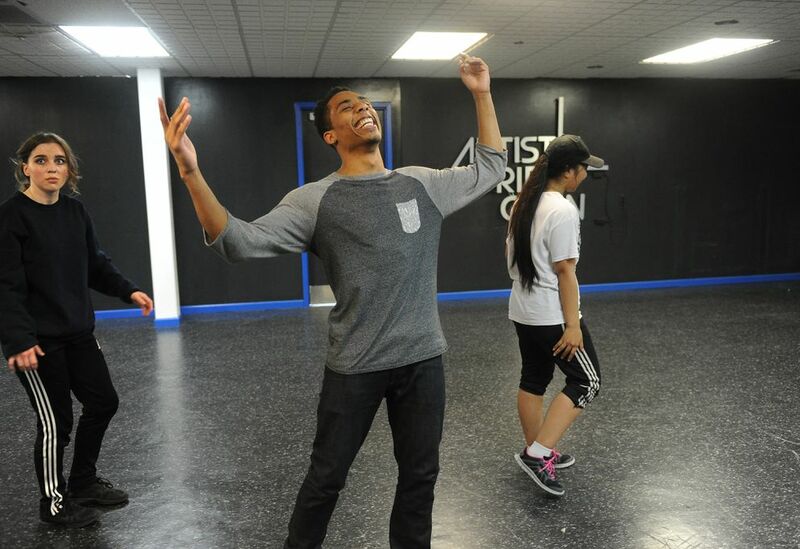 Hip-hop isn't the primary focus of most studios in Anchorage, though the style is popular. Freeman also doesn't know many 21-year-olds who run a business. "At first I kind of thought it was overwhelming," he said of taking on the responsibility of a studio. "But then I was like, 'Well, I can build from this, I can grow, this is my next step.' 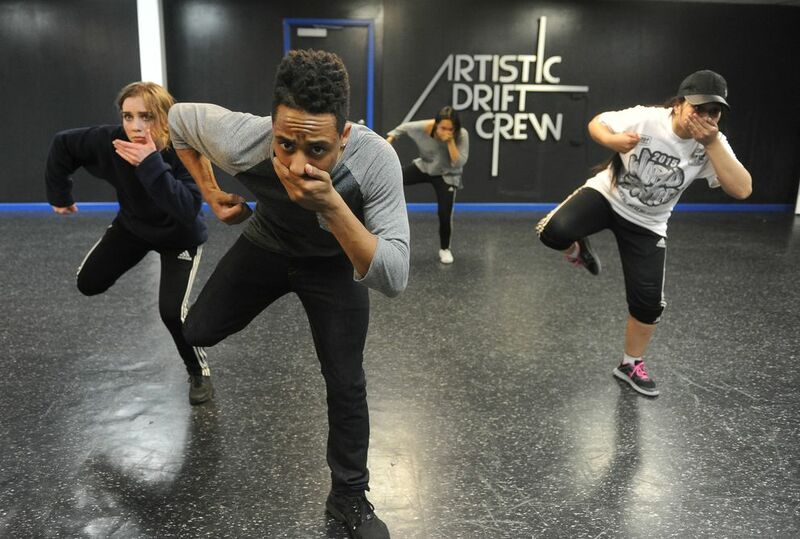 "
The space he's opening, called The Drift Gallery Dance Studio, will have its grand opening Friday at 5 p.m. The free event will include a jam — a freestyle dance competition — and give people a chance to check out the space, which is in the backside of the mall near Carrs. Freeman says the studio is for people of all ages and ability levels to learn hip-hop, though classes will be divided up by age groups. Classes are slated to start Aug. 15, just in time for the start of the school year. After cutting hair Tuesday, Freeman and four other young dancers met at The Drift Gallery to rehearse a routine for a promotional video Freeman's friend would shoot. They went over tricky parts slowly without music, and Freeman dished out positive feedback along with critiques. A freshly made sign for the studio lay near the edge of the dance floor, away from the dancers' fast-moving feet. The grand opening has been a long time coming. Freeman and his friends — who will also be teaching classes and helping Freeman run the studio — have put in long hours renovating the space, which used to be a day care. They've spent the summer painting over white walls, ripping out tile and carpet and even removing a tiny toilet made for children. "We all kind of have to sacrifice our whole, like, have-fun lifestyle that a lot of people our age have," said Freeman of himself and his colleagues, whose ages range from 18 to 20. "We have to kind of sacrifice it and just say, 'You know what, we're gonna rock it.' We'd dance anyway for our free time, so why not try and make something out of it instead of sit around?" Freeman's interest in dance started in high school and intensified with dance crew Artistic Drift, which is affiliated with Mao Tosi's AK PRIDE, a group created to be a positive influence on youth. Tosi is also a manager at the Northway Mall and has known Freeman for years. "If it wasn't for that group, I probably wouldn't be the dancer that I am today," said Freeman of Artistic Drift. "Because that group exposed me to dancing as a whole." The Drift Gallery Dance Studio's name is a nod to that influence, he said. Freeman says his initial dive into hip-hop was through break dancing and being a B-Boy, and he soaked up information wherever he could. Shows like "America's Best Dance Crew" and "So You Think You Can Dance" exposed him to the style diversity of hip-hop dance. Constantly watching videos online and observing the dancers around him introduced him to moves he hadn't seen before. And workshops and out-of-state competitions like Hip Hop International helped him hone his skills and grow as a dancer and choreographer. "I always wish that I was taught the same things that I know now a lot earlier because it would just create a shortcut," he said. Teaching offers Freeman a way to give others the early-stage instruction he didn't have. By leading classes at Studio Pulse in Midtown Anchorage and Dance Dynamics in Eagle River he's learned how to positively push students to execute the array of movements he throws at them. "It's all about how you describe what you're doing," he said. "It's all about how you are presenting yourself, your charisma, they way you encourage students, how you speak and come with courage and confidence … it takes a lot of time to learn to be like that, to be very projective, but even some of the worst dancers can be the best teachers." Freeman doesn't plan to cut Unique Blends out of his life after The Drift Gallery opens. Scheduling classes after school gets out allows him to keep his feet in both worlds. And thankfully, he says, his fellow dancer friends — also part of Artistic Drift — will help him out. Among them is Marquece Blanks, 19, who says he hopes the studio gives kids in the area a creative outlet and a constructive way to spend their time. Brenda Wenio, 18, is also assisting Freeman with the studio. Dance keeps her on a good path, she says. "For me, if I wasn't dancing right now I would be out there with my old friends … drinking and stuff. So it's a good way to keep me out of trouble," she said. A third colleague of Freeman's, 20-year-old Robyn Minor, says The Drift Gallery dancers are also trying to elevate hip-hop in Alaska. "I have been to a lot of studios in Alaska, trying to see which one I kind of wanted to stay at, so I've tried the hip-hop at other studios," said Minor, who met Freeman through dance classes. "A lot of people seem to be on the same track and not necessarily outdated, but sort of the same style that might not be meshed with the rest of the U.S. and where they're at in hip-hop." Freeman says he frequently looks for new elements to incorporate into his teaching. He also wants to form a "mega crew" — a large group of dancers performing at a high skill level, and a category in Outside dance competitions like Hip Hop International. "We are so distant from the rest of the world, and I don't want that," Freeman said. "I want people to see Alaska and say, 'Alaska has good dancers there, Alaska has cool art form.' "